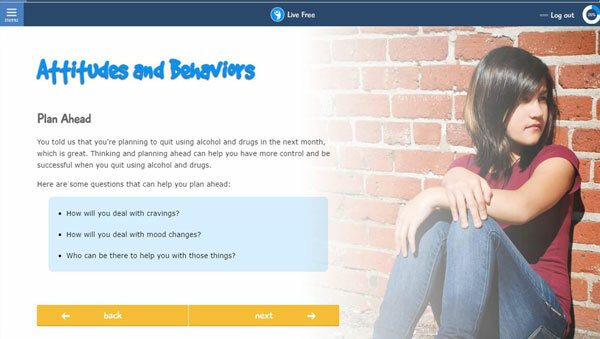 Live Free substance use cessation program is designed to help adolescents with a known or suspected substance use disorder stay away from all alcohol and drugs, including marijuana. The program is adapted from the Rise Above Your Situation (RAYS) program, developed with funding from the National Institute on Drug Abuse. Live Free assesses readiness to quit all alcohol and drugs and delivers stage-matched guidance designed to facilitate progress through the stages of change and prevent relapse. The program also helps youth identify and set goals around specific skills and activities (e.g., anger management, becoming a better student) that can help support a substance-free life and improve coping and well-being. Between sessions, youth have access to the Live Free homepage, which lists worksheets and information to support change.